Will you be unplugging your kids for screen free week? Or maybe your kids already know the joys of doing without televisions, computers and mobile devices? There’s nothing wrong with mixing kids and technology, but a week off can inspire your kids to discover new ways of keeping themselves entertained. More: After you’re done reading try out these –> check out the index of all our book lists. Doug Unplugged . My kids and I enjoyed this new book so much! Doug is a robot and his robot parents lovingly plug him in every day so he can download all sorts of interesting information. Then one day, Doug spots a pigeon on the windowsill and goes – unplugged – into the outside world, where he learns not all relevant information comes from an outlet. Ironically, it’s also available as an ebook. hello! hello! This selection from Mathew Cordell was one of our top books of 2012. Lydia’s family members are all glued to their personal screens. When Lydia’s screen goes dark she is lured outside by an open doorway. What she discovers out there is so marvelous she convinces her family to drop their electronic devices and join her. Ironically, also available as an ebook. Chloe . Chloe from Henry in Love has her own book! When a large television takes over family fun time, Chloe must convince her parents and 10 brothers and sisters what every toddler knows: the packaging (bubble wrap and cardboard box) is much more fun that the gift (the tv)! Blackout . I have a soft spot for Rocco’s book set in Brooklyn and inspired by the Great Blackout of 2003. When an entire city goes dark a family finds joy on the rooftops and streets of their community. And when the lights come back on? Well, sometimes it’s good to turn them right back off. Rocco’s color-saturated illustrations are spectacular and this book found it’s way on to many “best of” lists in 2011. Press Here . If you have a sneaking suspicion that your kids will balk at the idea of giving up the iPad for a whole week (gasp!) introduced them to a book I like to call a “screen-free app. Each page of this interactive book requires kids perform a task that sets in motion a series of magical events. Press Here is also my #1 gift recommendation for kids ages 1-3. I’m Bored . Turn the tables on kids whose favorite phrase is the dreaded “I’m booooorreeeed….” A young protagonist with the blaahs tries to convince a potato (here I had the pleasure of explaining the term “couch potato” to my son) that, in fact, kids are far from boring. The potato, however, remains unconvinced and the fun twist at the end will get your kids giggling. A Few Blocks . Although Cybèle Young’s book may not seem to fit in with this list, parents of squabbling siblings who need to remind them of the pleasures of cooperative imaginative play. Exquisite illustrations concocted from painted 3-dimensional paper sculpture tell the story of a sister who uses fantasy and storytelling to help her brother on their way to school. Disclosure: This post contains affiliate links through. I always choose books based on my and my kids personal opinions. Erica- this list is brilliant. I can’t describe the excitement I felt as I read through your descriptions. Every single one of them sounds fantastic. Now to see if I can locate them in Australia,. Can I suggest another book to add to this list- Ten Tiny Things by Meg McKinlay I can’t access my blog at the moment to share a link. though. P.S. I love your new header/button. Thanks Jackie. I haven’t been able to get a copy of Ten Tiny Things. I remember your review and thought it sounded wonderful. My kids liked Ten Tiny Things too – another one I thought of was It’s a Book by Lane Smith, they thought that was a hoot! Oh, yes! I can’t believe I forgot about that one, I actually reviewed that once, too. D’oh! What a great idea! And how timely! I’m a freelance journalist wondering if any parents reading this have TV-free households. If so, what do your kids think about growing up without TV? Do they recommend it or not? I’m currently writing an article for Press4Kids, a daily newspaper for kids, and I’d like to feature your 6- to 12-year-old’s opinion. If interested, please respond ASAP and I will get back to you. Great list! Another good one is When Charlie McButton Lost Power by Suzanne Collins. Thanks, Paula! I hadn’t heard of that one. Adding it to my to-read list. Yes, for sure a four year old will LOVE it. Love this list! I really want to read I’m Bored and Doug Unplugged. I’ll have to get Doug Unplugged as an ebook just for the irony! I know, that cracked me up. 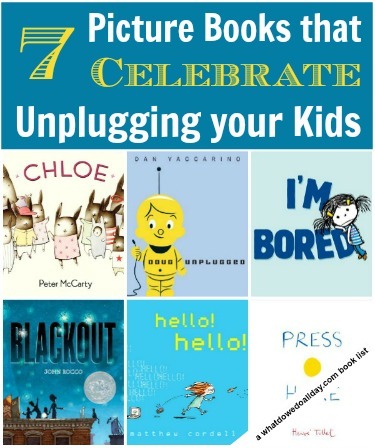 A book that’s all about unplugging but you have to plug in to read it. Does seem a bit odd. All of these books are so good! hello! hello! is a favorite of ours. We just read a new one called Return of the Library Dragon. A school library has had all of their books taken away to create a children’s cybrary. The library and children revolt and the books are returned. It’s good! Ella Unplugged is another one we like about a little girl who wants her family back from all of their devices. I received it for review and months later my son still enjoys reading it. Moderation is so difficult with all this new technology. Visiting from Montessori Monday. I’d love for you to share your family-friendly crafts and ideas at Monday Kid Corner at thejennyevolution.com. See you at the party! Fantastic post! I’ve added a few of these titles to my wish list. My son and I participated in screen-free week last year and got a lot out of the experience. We actually purchased Doug Unplugged specifically for that reason and really enjoyed it. This year my son is in kindergarten and I’m speaking to the local library, kindergarten and a few other groups to try to spread the word about screen-free week. Will you be participating again this year? Yes, we will be joining in again! We don’t have much screen time except for a few movies here and there. The boys play the iPad at their grandparents’ on Sundays but that’s it. I know this is an older post but it isn’t complete without The Wretched Stone by Chris Van Allsburg! http://www.chrisvanallsburg.com/wretchedstone.html. Even though it pre-dates the iPad (it was published in 1991) it is still amazingly relevant, perhaps even more so today than when it was originally published. We also love the book Mouse TV. It was one of just a few books my sister liked as a kid, and now my kids have her old copy and my 4-year-old daughter loves it. The family has a lot of fun actually doing all of the things they normally watch shows about.